Welcoming brick colonial in West Park! Spacious living room with fireplace that leads to an inviting three season room. Dining room with built in china cabinet. Eat-in kitchen with granite countertops, tile backsplash, floor in 2017, plenty of oak cabinets, and appliances stay! Plus, first floor half bath. Enjoy the beautiful refinished hardwood floors 2018. Second floor has a master bedroom with his and her closets and ceiling fan, second bedrooms with walk-in closet and third bedroom with ceiling fan. Ninety square foot additional room, adjacent to third bedrooms, added above sun room. Rec room with knotty pine paneling, a bar for entertaining, fireplace and tile floor, laundry area and plenty of storage. Nice sized backyard, two-car detached garage with opener and shed. Many updates to include: newer vinyl windows, glass block windows, 100 amp breakers, newer concrete and roof. Nice backyard fenced on the sides. 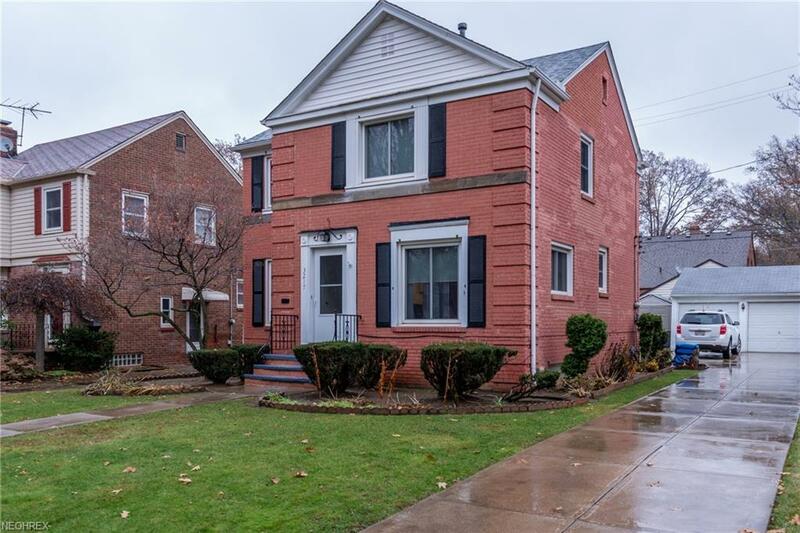 Conveniences include: RTA bus lines and Triskett Rapid, two blocks to I-90 and Warren Village Shopping Center, and minutes to schools, entertainment, and local parks. Availability of Cleveland Metropolitan School District vouchers. Don't miss out on this one!